After the latest State Department announcement that Hillary Clinton violated government rules, Judge Andrew Napolitano definitively says there is now ample evidence to indict. Sadly, he is much less certain on whether or not the indictment will actually come. When Bill O’reilly was surprised to hear about the fact that Clinton was concerned about having documents subject to FOIA, Napolitano hammers home the the point that now the FBI has intent. 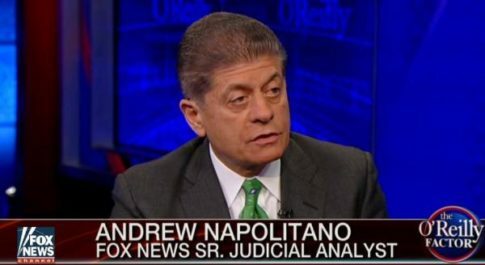 On whether or not Napolitano believes, after all of the above, that Clinton will actually be indicted, the judge wasn’t so sure. And just as we said long ago, Napolitano also believes that one way or another, the FBI will get the evidence out to the public. Well then, based on Obama’s guarantee that there will be absolutely no political influence in the decision on whether or not the DOJ decides to indict, we should expect the indictment in the coming months… right? Tags: Andrew Napolitano, Global News, Government, Hillary Clinton, Politics, U.S.